A few splashes of colors can do wonders for your home! Choosing your paint colors is one of the most fun aspects of doing projects at home, but it can also be stressful if you don’t have clear inspiration or direction for your design. Color can go a long way when it comes to creating the right atmosphere. Check out these tips for choosing the right paint colors for your home! If you’re unsure about your color choices, you can begin by starting in a smaller space. Choose a bathroom or small hallway to experiment with color before moving onto a bigger room. After you have done so, you can test out some colors and tones that you might want to incorporate into a larger space. If you choose a color that you don’t like, it will be much easier to change on a smaller surface. To get on the right path of choosing the right color, you can start by creating a mood board. Gather some sources of inspiration from magazines. Use the texture from the furniture you’re placing in the room to get a better sense of direction for color. This will help you understand what atmosphere you’d like to create, whether it’s relaxation or energy. It will help narrow down your choices of brightness and tone. Remember that the amount and type of lighting in the room will directly affect how it will look once it’s up on the walls. Natural light will highlight the true color while incandescent light will bring out warmer, yellow tones. For example, fluorescent light will cast a sharp, blue tone. 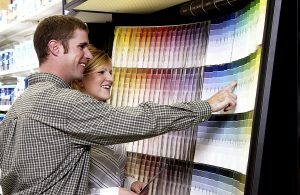 As your shopping for color, it’s important that you know the associated terms, especially if you consult a designer or representative at a hardware store. Hue is what most of us call color while the value refers to how light or dark it is. Intensity refers to the brilliance of the color or the intensity of the hue. A color wheel will help you choose complementary colors. On the wheel, you’ll see which colors sit across from each other and which are directly next to each other. This will help you come up with some interesting, and even surprising, color combinations.